Today you are going to learn how fast and easy you can manifest what you want in life – by creating MANIFESTING MOMENTUM. Let’s dive in and SPEED UP! At first they stuttered. Then they stammered. Then they asked me to name 10 quick manifestations for them, just to prove that it could be done. So I did, I named 10 successes that showed up THAT DAY. And then they did too, it just took them a little bit longer – to do what they thought was IMPOSSIBLE – just a few minutes before. And once they did that, they experienced a massive shift – one that will bless them forever. …lets read this life changing lesson of Neville’s in a new way. ….in fact imagining EVERY moment in time, but for most of us – until you work with what we teach here – you aren’t going to notice how much you imagine – how often it comes true and it’s not going to be consciously. Quick Example: I was working on THIS very article, and got a little stuck. I so I geared my self toward getting it done and I imagined being the writer – who is in the flow, and enjoying wRiting effortlessly. I imagined being the down to earth – simple writer who shares what he loves and what he knows works. Then for a moment – I sat in the silence – in the faith – knowing – feeling – THIS ARTICLE is done. ,.. and I spontaneously imagined – I felt like practicing some kung fu out in the garden. Then I noticed “I” was beginning to stand up and reach for my practice sticks – so I could practice some kung fu stick fighting methods. Those are always good fun for me and get the blood pumping. …and I found my body doing some wonderful feeling kung fu drills that got me “back in the flow” and here I am writing this article for you. Manifestation #1 – I manifested what it wanted, being a writer in the state of flow, by not DEFINING what it took to get into the state of flow. 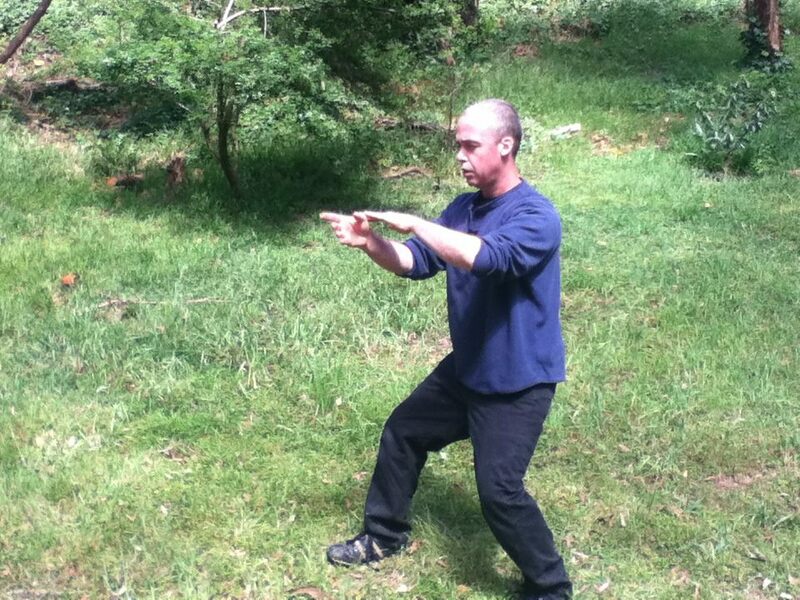 Manifestation # 2– I SPONTANEOUSLY IMAGINED – and manifested the body doing kung fu exercises. Imagining effectively “the body” (part of the universe doing something) created the state – of the body doing it. This led to the state of flow. Power Point: Study The Sequence! I geared up as Neville says to do, when I first imagined being in the flow – as the writer – who had a FINISHED article. I sat in silence – in FAITH – actually knowing it was done. Then the imagination on it’s own – after my session – wandered- just a little bit – and I found it focused on – IMAGINING – some kung fu. Which I “geared up” to do. Letting the imagination lead my behavior – took my body outside – got my blood flowing with great feel good neuropeptides – and got me in the state to write. BECAUSE, the more you notice that you can manifest DOZENS OF tiny seeming things a day, the more you will truly get into “the flow” of manifesting – the “big seeming” things in life become easy too. SOLID GOLD NUGGET: I didn’t have to force myself, or motivate myself or struggle and use “will power” to write, do kung fu, etc. Doing all that will exhaust you. Instead – get into FLOW. …and want more flow and ease in your life, get this very special program of ours – Manifesting To The Max. We went behind the scenes in Manifesting To The Max, and shared with you EXACTLY how we are playing with this stuff – FULL ON – right now. If you want more of that, dive in to MAX TODAY. PS: I remember when I didn’t have much of ANY flow in my life. Every day was as struggle. Every time the phone rang, I held my breath. Every time I thought I was getting ahead – I fell further behind. And FLOW made changed all that – and made every day delightful. 14 Comments on "Making Manifesting Easy – Manifesting Momentum – Free Neville Goddard"
What do you mean by resisting being part of the natural flow? Does this have to do with following our instinct? I’m not sure. Great question. Resisting part of the natural flow of being a teacher / writer would be resisting answering this question, for example. Or refusing to teach and write in general. Imagining myself being an amazing martial artist drew me to train quite a bit when younger, and to this day – draws me to train and explore martial arts. How does one protect their property when they cannot remain on it 24//7? Hi Mr.20 20 :-). Please can you help me on something? First of all sorry for the language because it’s not my native language and SORRY for bothering you on this. I’m doing an application to get a green card to join my wife who lives in another country. I’d like to get there this year.So ,i have to imagine the day after i get there or the day i get the green card or something else? Imagine living with her mate. We suspect that is what you really want. Stop imagining that you need to protect your property 24/7. That should shift some things. Neville talks about this in his book “Feeling is the Secret”– “What more beautiful description of this romance of the conscious and subconscious is there than that told in the Song of Solomon..By night on my bed I sought him whom my soul loveth, I found him whom my soul loveth, I held him and I did not let him go, until I had brought him into my mother’s house, and into the chamber of her that conceived me.” Is that what you want? @Theodora-Neville Goddard always says that we become what we are and not what we want. Are you following that statement? It is not only imagining. We do not have or become what we want, rather what we are. A true desire is not to have but to be. You want a true love, you have to become a loving person. A true loving person who does not pretend. and those things would pop up right there forgetting about the Divine qualities that are humility, self-sacrifice, love, compassion, etc.